A number of Wareham ancestors emigrated to Australia and New Zealand. Any information on how they got on etc would be most welcome.This page is about those who emigrated to Australia. They left London on 28th September 1854 arriving in Sydney, Botany Bay on 13th January 1855. The emigration was arranged as part of the 'Caroline Chisholm Family Migration Scheme' on board the barque Bangalore which had been chartered by The Family Colonization Loan Society. Mary Ann Wareham nee Line died two years after arriving in Australia. On her death certificate, the informant is a James Line – is this her brother and perhaps the reason why they emigrated ? Sophia Mary Wareham - she married Archibald Gray in London 1841 and they both emigrated, she died in Sydney 1883. Jane Wareham - she married John Noble in London 1852 and they both emigrated, she died in West Maitland 1869. 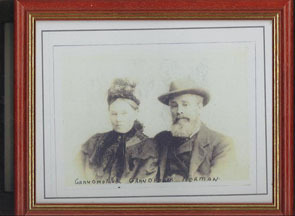 Thomas Beaumont Wareham - he married in Sydney 1860. One sibling emigrated to New Zealand (ElizaWareham) and four stayed in England (George, William, James and Edward Alport Wareham). Edward Alport Wareham became a missionary and was an important figure in the London Missionary Society (LMS) which was a protestant missionary society formed in England in 1795 'to spread the knowledge of Christ among heathen and other unenlightened nations'. Apart from Thomas Beaumont Wareham, perhaps coincidently, perhaps for some other reason, all the boys stayed in England and the girls emigrated !